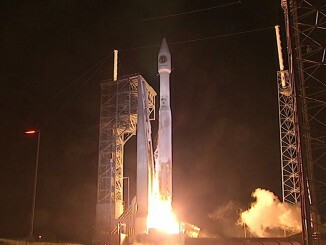 CAPE CANAVERAL — A covert communications relay station to route spy satellite data directly to users was successfully launched by a million-pound Atlas 5 rocket overnight. The United Launch Alliance rocket left Cape Canaveral under the cover of darkness at 3:28 a.m. EDT (0728 GMT), dodging rain showers while speeding through decks of clouds, for a trek to geosynchronous transfer orbit to deploy the NROL-52 spacecraft. The fifth launch attempt proved to be the charm for NROL-52 after four thwarted tries over the past week, mainly due to bad weather. The last Atlas variant of any kind with this many scrubs was AC-167, the final Atlas 2AS in 2004, that experienced four scrubs and launched on the fifth try. The Atlas 5-421 vehicle, powered by its main engine and and two thrust-augmentation solid rocket boosters, thundered eastward on the company’s second mission in service to the National Reconnaissance Office in three weeks. Out of the public eye, the high-energy Centaur upper stage performed a pair of burns that shaped the preliminary orbit of the payload. An official declaration of launch success came about 90 minutes after liftoff, marking the 145th consecutive successful Atlas program launch spanning more than two decades and the 74th for an Atlas 5. 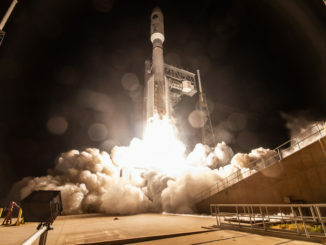 “After recovering from Hurricane Irma that came through the area last month, and the last week’s weather challenges, the team found the right opportunity today to deliver this critical national asset to orbit,” Laura Maginnis, ULA vice president of Government Satellite Launch, said in the post-launch press release. It was United Launch Alliance’s 122nd successful mission. 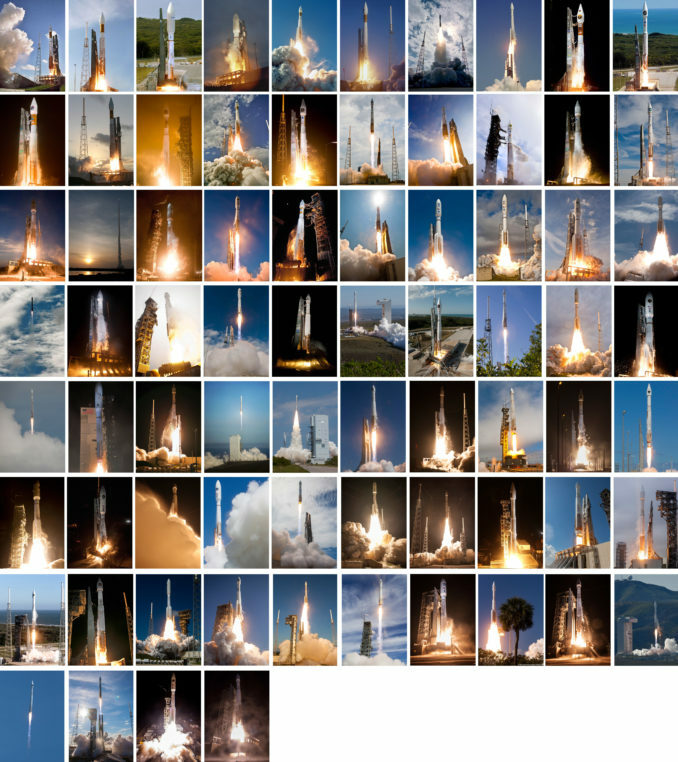 The firm has averaged one launch per month, every month, for the past 11 years. Little to nothing is known about the secretive spacecraft launched today. But there is plenty of speculation that this is another relay platform for the NRO as part of the Satellite Data System. “The QUASAR (SDS) system’s main role is probably still data relay for NRO imaging and radar satellites in low orbit,” said Jonathan McDowell, an astronomer at the Harvard-Smithsonian Center for Astrophysics and noted space historian. Likely the second one built in its generation, the payload will be operated in geosynchronous orbit 22,300 miles above the Earth to enable the NRO to receive timely imagery and data from its fleet of low-earth-orbiting surveillance observatories. A similar Atlas launch was accomplished last summer, likely the beginnings of the fourth generation for SDS. The program once had the codename QUASAR. “NROL-61, launched in July 2016, is believed to be an SDS, in part because it operates in a geosynchronous slot known to have been occupied by earlier SDS spacecraft. It is believed to be the first fourth generation SDS, due to the increase in mass and size over earlier models, that could be inferred from its launch vehicle and fairing. The NOTAM coordinates of the NROL-52 launch are nearly identical to those of NROL-61; therefore, it almost certainly will enter a similar orbit,” said respected satellite observer Ted Molczan. The satellite will have a constant view of nearly one-third of the globe, allowing receipt of the reconnaissance data and routing it to a central ground hub. Exquisite-class electro-optical and radar-imaging satellites operate much closer to Earth, causing them to remain out of contact with ground-receiving stations during most of each orbit. The NRO has been sending up SDS birds since 1976 to receive transmissions from surveillance craft. The SDS constellation enables the data to reach analysts much quicker than waiting for the spy satellites themselves to pass over the relatively few number of ground antennas. “The first imagery intelligence satellites took photos on film, which had two drawbacks: the film had to be returned to Earth for processing, often resulting in unacceptable delays in obtaining intelligence; once the film ran out, the satellites became useless, Molczan said. SDS acts in similar fashion to NASA’s civilian Tracking and Data Relay Satellite System to route communications from the International Space Station and science data from unmanned observatories. Sky-watchers say that the NRO originally used highly elliptical, highly inclined orbits for SDS. The first use of geosynchronous orbit around the planet’s equator was in 1990 after an SDS was launched by the crew of space shuttle Atlantis. “The unprecedented nearly 10-year gap since the launch of an SDS to Molniya orbit has led to speculation that the NRO is transitioning to an all-GEO constellation. Time will tell. I have no idea why GEO would be preferred over Molniya,” Molczan said. 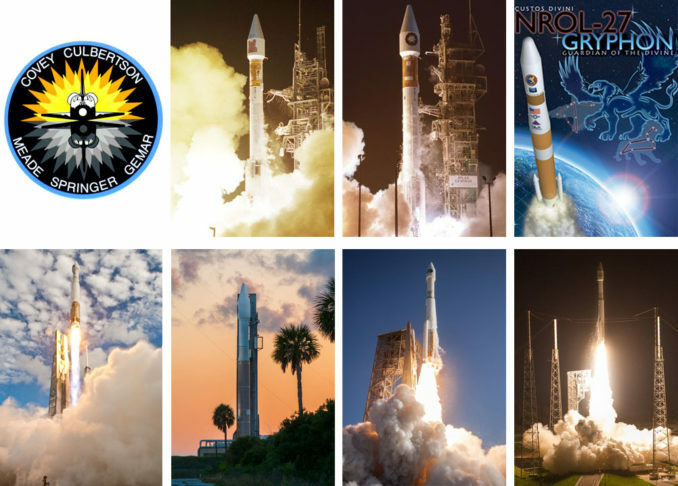 ULA has two more high-profile launches to go this year, both from Vandenberg Air Force Base in California. The $1.6 billion JPSS 1 polar-orbiting weather observatory will be lofted by the penultimate Delta 2 rocket in November and the NROL-47 payload will be launched by a Delta 4 in December. The next Atlas 5 is planned for January to loft a missile early-warning satellite for the Air Force.